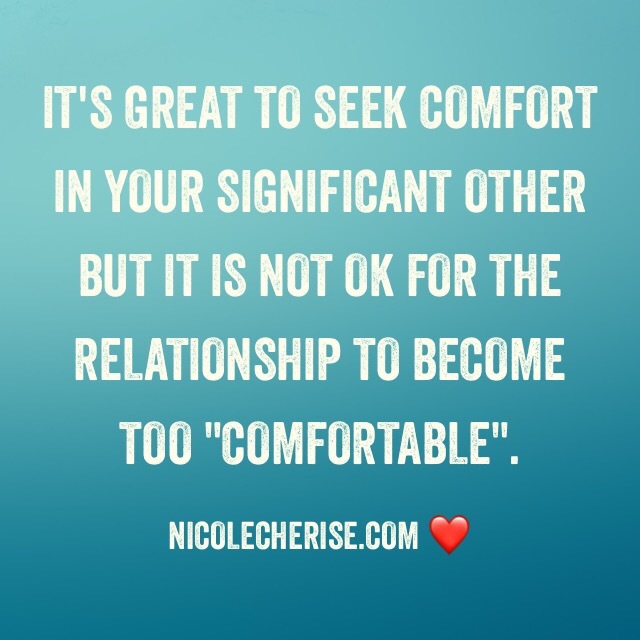 Feel Good Friday: Seek comfort in your S.O. but don’t get too Comfortable. Hi friends! Happy Friday to all! Isn’t this always the topic of discussion amongst friends? You are deeply in love with your partner. You reached a place in the relationship where you are happy, trusting and loyal to one another. However, some how, you both get too “comfortable”. Lacking responsibilities one once had. That’s just a few, if you can think of more, please drop it in the comments section. Even though those things may seem like minor issues that couples endure, they can become bigger problems down the road. When people ask me for advice in this matter, I’ll tell them to C̶O̶M̶M̶U̶N̶I̶C̶A̶T̶E̶ Effectively Communicate with their significant other. Go into the conversation with an open mind, speak calmly, and be respectful. Also, we have to remember that nothing changes overnight. It takes time, patience and leading by example. Has this been anyone else? Can you admit that you’ve gotten too comfortable in your relationship before? Let’s discuss below. Just a reminder for couples. Never Stop dating, don’t stop effectively communicating, get “dolled” up, be intimate, remain best friends. That’s only a few of the things that started the foundation of a relationship. Unfortunately, over time, many couples become too “relaxed” or it becomes “boring” and it’s because they have become too comfortable. The good news is, a couple can always spice things up or change up their “routine”. Things can get better as long as both people want to do better. Thanks great people for reading!